The buildings of Lorsch Abbey, which was declared a UNESCO World Heritage Site in 1991, have not survived in their entirety. And yet it is still possible to experience the abbey as a special place today thanks to modern landscape architecture. Still to be found on the abbey grounds covering almost 3 hectares are the remains of the early medieval Benedictine monastery, consisting of the Königshalle (“King’s Hall”), a fragment of the basilica and part of the monastery wall. 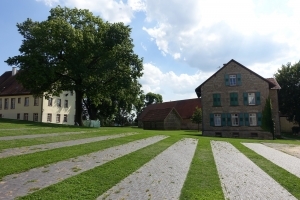 The new design of the abbey grounds which was conceived by Berlin landscape architects Topotek1 and realised in 2017 brings the lost buildings back to life as “footprints”. The vanished church and cloister are embedded in the carefully tended lawns as strictly defined imprints. Walking on the grass is encouraged as is exploration of the cultural landscape. The abbey grounds in the town centre are linked by a network of paths to the earlier monastery of Altenmünster. A circular path also takes in the Carolingian open-air museum of Lauresham, where it is possible to explore the absorbing world of the Carolingians. The area behind the tithe barn, now converted into a visible storage facility, allow visitors to experience the herbs mentioned in the Lorsch Pharmacopoeia with all their senses. The Benedictine abbey in Lorsch in southern Hesse was dissolved as early as 1557. Although the original structures have largely been lost, Lorsch Abbey was declared a World Heritage Site in 1991, not least because of its gatehouse, one of the last remaining Carolingian structures and testimonies to the post-Roman period east of the Rhine. The aims of the new landscape architecture were to accentuate the still existing remains, to delineate traces and to add new structures with care in order to uncover and reveal to visitors the history and significance of the site as well as its relationship to the cultural landscape. The new design of the grounds is an example of contemporary landscape architecture which brings to life an early mediaeval abbey whose structures have been largely destroyed. The Carolingian gatehouse, a fragment of the church and part of the monastery wall have survived as historical remains from the 8th century. These are supplemented by the tithe barn, the elector’s house and the forester’s house from later periods. Topotek1, the landscape architects from Berlin, have make it possible to identify and walk through the lost structures again by imprinting them as clearly demarcated historical “footprints” in an extremely reduced landscape. The minimalist design makes use of lush lawns from which single solitary trees and the historical buildings rise up as individual monuments. The site is an archaeological monument, the archaeological finds being located just a few centimetres beneath the grass surface. Rather than being dug into the soil, the new design was thus created on top of it. The uninterrupted view of the elevated abbey walls and grounds already give visitors approaching the complex an impression of the scale and structure of the abbey. Further information on the relationship between the abbey and the surrounding cultural landscape can be obtained by following the “Nature Path” or the “Cultural Path”. Within the abbey walls, slight changes to the topography – mostly in the form of cleanly slanting indentations – make it possible to identify the former buildings (monastery church, enclosed forecourt, cloister with covered walkway) and their positions relative to each other. It is as if the vanished buildings have left their footprints in the dark, lush lawn. Sections of lawn and paving alternate on the approach to the gatehouse, resulting in a gentle slope which gives the impression of a flight of steps with oversized treads. 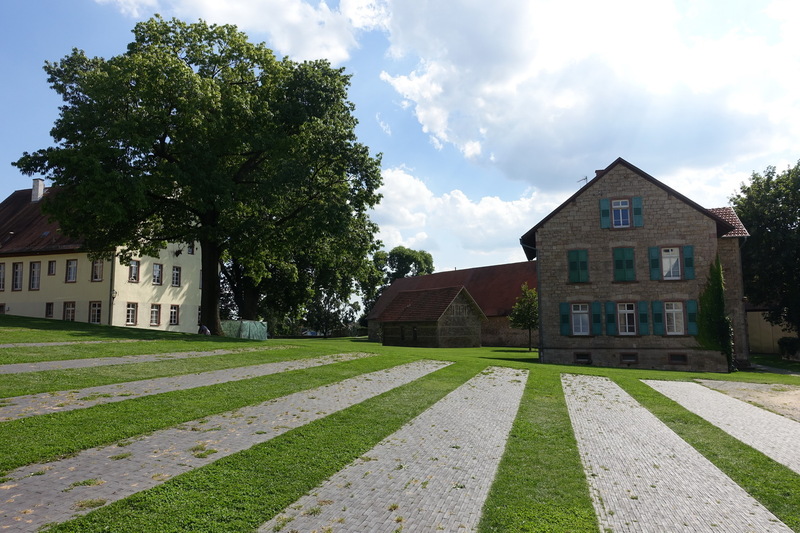 The alternation between lawn and paving interlinks the abbey grounds with the town. The herb garden behind the tithe barn is a new element. 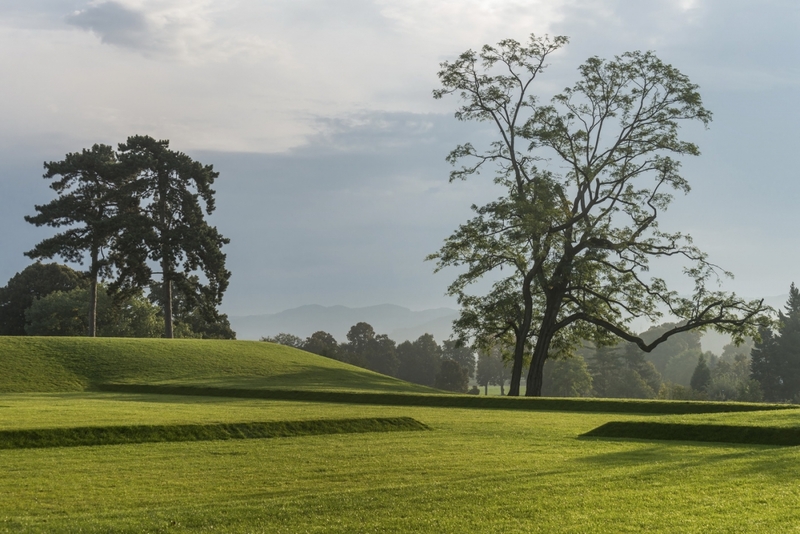 While there is no historical evidence for the garden, its planting is based on the “Lorsch Pharmacopoeia”, which was written around 800 A.D. and was placed on the UNESCO Memory of the World Register in 2013. The plants mentioned in this book can be found in the garden, which hugs its way down a small slope in terraces formed by numerous dry walls. The garden’s wealth of blossoms and colours combined with the surrounding (fruit) trees make it a magnet for visitors. Its small-scale layout forms a strong contrast to the overall impact of the grounds and it thus comes as no surprise that the herb garden behind the tithe barn appears somewhat “tucked away”. Here as throughout the grounds, visitors are guided by a network of paths laid out like bands along the structures, whereby the ends and curves of these bands do not run “seamlessly” into each other but overlap instead, akin to points on a railway track. The new design has given the site a new aura which does justice to the dignity of the location. Further details on the landscape architecture are available at www.topotek1.de. Barrier-free access: The main paths and the museum are accessible to visitors with mobility disabilities. Dogs: Dogs must be kept on a short leash in the grounds.